Art is a social beast. It is created for people and is driven by people. A creator who doesn’t target an audience, even if that audience is a single person, is not a true artist. Art by its very nature carries a message. Otherwise it is just craft. The message in each art piece may not alway be obvious. A painting or a sculpture may be political by nature, or it may simply wish to share the deepest most personal corners of the artist’s mind. Regardless of the specific purpose of a given creation, art is always a conversation. A conversation between the creator and the observer. I, the artist, create something and send it out into the world for you, the audience, to interact with it. Your emotional and critical analysis of what you think you see is your response to me. Gathering hundreds of such responses across different demographics allows me to understand how my message was received, how it was altered by the eyes of the observers, and what emotion it evoked in which people, thus allowing me to alter my future works to either please or distress the audience further. Just as in a verbal conversation, it will take some back and forth communication before we establish if we are even talking about the same thing, and if we are do we agree on it. Unlike a casual verbal conversation I have to adjust to the fact that my opponent, for a lack of a better word, is not a constant. Instead I am conversing with an entity that is ever changing, ever evolving and adjusting, reshaping itself by taking on new individuals while shedding other. This conversation is never ending. It goes on for as long as I create and share art, and its main purpose is personal artistic growth. In today’s world of social media it is easy for an artist to share her work with large number of people all over the world. One would think that a virtually instant acquisition of a large diverse audience would be desired and useful, but unfortunately it comes with a price. The feedback given by the digital masses is heavily diluted with comments that are not only unprofessional and biased but can also be detrimental to the artist and the art. The internet has changed the artist/audience conversation rapidly and significantly, making it difficult for the artist to accept feedback as reliable and usable information. One of the biggest problems with the internet is that it has given everyone a voice without teaching people the ethics of communication. A hundred people looking at the same work of art will see a hundred different things. That is the beauty and the curse of creation. The infamous “like” button and the ability to instantly leave a comment, has opened a Pandora’s box of meaningless noise. Many people believe that their immediate personal emotional response is a legitimate form of feedback, and they have reduced their voices to single word statements like “awesome”, “great”, “terrible”, “disgusting”, “why”, “lol” etc. Whether these responses are positive or negative, they are completely irrelevant to the artist, or the rest of the audience for that matter, without a brief explanation of why. Many people don’t realize that they are branding something with a “yay” or a “nay” based solely on what they would or would not like to see in their house, and not considering the work as a whole. For instance, when reviewing these two dolls the audience will be pretty divided. Some will prefer the sparkly blond angel princess, while others will be drawn to the gothic poet with messy hair and piercings. 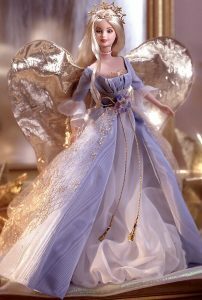 Personally, I would never make or purchase the angel doll, but I recognize that this particular one is made just as well as my gothic poet. I see that her dress is made with equal care and attention to detail. If it is handmade doll, someone clearly spent a lot of time and care one it. It took skill to attach the wings and design the crown. The character has personality and is clearly beautiful in its composure, expression and pose. If it is factory made, it becomes significantly less interesting to me, but I still can’t argue the fact that is of good quality and well designed. If I knew a girl who likes angels, I would consider buying this doll as a gift. I am not so blown away by this doll to leave feedback on her listing, nor am I so bored and disgusted by her pure stereotypical beauty that I will care to negatively comment on her. Coming across work like this, I make some mental notes, but I do not take the time to comment or review. It’s not necessary. My feedback, in this case, is irrelevant. This doll is simply not in my style. 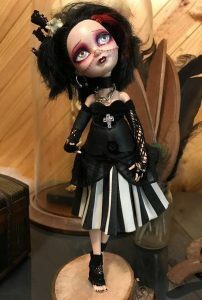 Looking at my own gothic doll, on the other hand, many people may praise her just for being dark and unusual without paying attention to the detail or reading the back story which I create for all my characters. Some others may immediately get offended and leave nasty comments based on their personal preference, failing to consider the skill and care that was necessary to create her. What artists really seek is constructive criticism. In my opinion, if one is unable to deliver it, they should not speak at all. Constructive criticism, unlike the impulsive spewing of single word remarks, aims to collaboratively improve the overall quality of the artwork in question. It should examine both pros and cons considering style, motivation, occasion, and purpose. It should also provide specific suggestions for positive change or even just encouragement. One should aways consider the style and the media used when providing constructive criticism. If one is not knowledgeable in a certain art style or material, perhaps one should hold their tongue. Consider for a moment that you may not be the targeted audience. No one artist ever aims to please everyone. 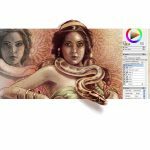 If you know nothing about digital art and what is involved in the making of a digital painting, you are not fit to review one. If you are opposed to all things gothic, reviewing a hand made gothic doll with “terrible” despite its intricacies and superb craftsmanship is neither helpful nor appropriate. You don’t like that style. That’s opinion, not feedback. Unfortunately, with all this noise it becomes difficult for an artist to take positive comments seriously as well. Just because your creation collected many “likes” and “<3″s may not mean that your skill level is really at its highest. Also, without specific descriptions about what exactly attracted the “likes” it is impossible to know which aspects of my art are making the audience happy. 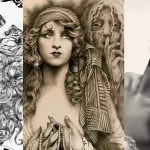 When leaving a comment on a work of art that you see on Facebook or Instagram, or Etsy, or Deviant Art, consider first who you are leaving that comment for and what effect do you wish for it to have. Even if you don’t like something, ask yourself “am I so offended by this style and this message that I should take the time to tell other viewers about it and to let the artist know that he offended me with his creation?” If the answer is yes, by all means, put it in writing. But be courteous enough to write more than just a single emotional exclamation. Explain your position and use specific details. Otherwise, refrain yourself from a comment all together. Our digital age has made it easy for people to post things that they would not normally say to each other face to face. If you came to my home studio or a gallery show, you would most likely not scream “disgusting” while looking at one of my taxidermy displays. As a matter of fact, knowing that it is a taxidermy show and knowing that it’s not your cup of tea, you would probably just not go to my house or the show to begin with. If you don’t like what you see on my website or on my Facebook page, go somewhere else. The internet is huge and filled with a little bit of everything for every taste. What people fail to realize is that artists, true artists, put all of themselves into each creation. When you speak to or of my art work you are speaking to me directly. Consider, when leaving a comment, how the person who reads it will feel. Consider all the things that you are putting in motion. Consider how much courage it takes for artist to share their art with you to begin with, and now consider for a moment that maybe you just offended someone enough to stop creating all together. Words are very powerful tools, and most people use them carelessly. Imagine if blind children were given swords and bayonets and told they can do whatever they want with them. It would be a disaster in no time. Don’t swing your sword around just because you have it. Learn how to use it first and then make precise determined moves if any are even necessary. Do you want to use your weapon to defend a work of art or to stab it to death? Both are legitimate options. Artists invest a lifetime of training and self improvement to bring you a single work of art. All we ask in return is that you invest some time and care in your response to us. One Response to " How your voices shape future art "
Very well said. I wish we could get more activity than the automatic click the But, I also think it is a more than a little understandable on their part. After all, we live in a time where we are being told what we can and cannot say. Where others decide what are ‘hurtful’ words, for us. And what is proper or improper verbiage. It is the age of political correctness in the extreme. And it does affect all our behaviors whether we admit it or not. If fans don’t comment, they won’t have to stand behind their words and defend themselves against those who come out of the woodwork to belittle, berate and even sometimes threaten them, for speaking their minds. We’ve ALL, seen it happen. You are absolutely correct. Words are powerful. And they can be used by artists to praise our fans. To encourage them to keep moving forward. Words can also be used by artists and their occasionally rabid fans, to verbally abuse and bash the ever living bits out those who do not like their work or have had a bad experience with an individual artist and mentioned it. While I wish the “like and love” clickers would leave a comment, I understand why they don’t want too expose themselves to what could come to them for daring to leave an honest opinion or a critique. I don’t find it at all surprising that people rarely comment. I am surprised as many comment, as do.